BLUE is SOLD OUT! Only Tan available, and going fast! These adorable 8" x 25" distressed wooden Shutters are proud to display this high quality antiqued stitched and embroided flag. Each has a shape cutout which allows a smaller antiqued flag to peak through. Topped off with a metal star and a raffia bow, this make the perfect wall plaque for your Americana Room or your front entrance. 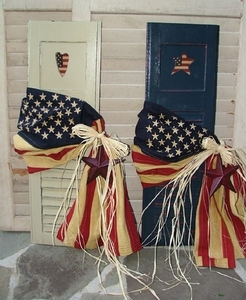 From the Jody Cranford Collection of Handmade Americana Decor.